The Foreign Service Online Community Is Live – Join the Conversation! Do You Have Your Baseball Tickets Yet? 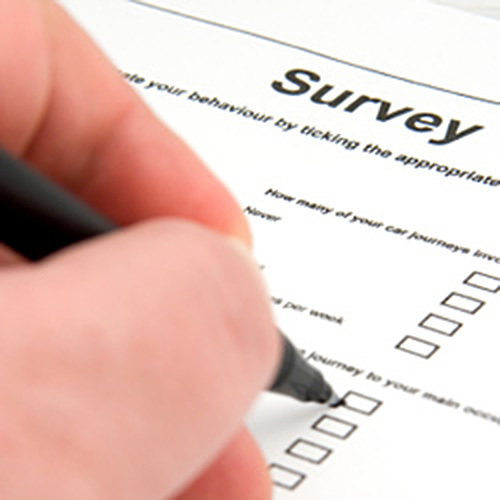 Last month AFSA asked retiree members to fill out a survey to provide feedback on our current member services and insight on your areas of interest. The response was fantastic, with more than a third of all retiree members completing the survey. AFSA provided a summary of initial finding in an email sent to all retiree members and is working on a full readout of the survey results to be published in the September issue of The Foreign Service Journal. AFSA staff is digging into the results to identify both short-term and long-term program ideas. The last question of the survey was open ended and asked participants to share the type of programming they would like AFSA to provide or in some cases continue to provide through our Federal Benefits Speakers series. We are beginning to schedule out programs, including a presentation on the coordination of FEHB and Medicare by AFSPA’s Paula Jakub scheduled for August 23. This event, and others soon to be announced, will be recorded and made available on our website for members who are unable to attend and/or those living outside the Washington, D.C. area. If you are looking for information on a specific topic in the meantime, please remember to visit our website where we have an archive of recorded videos of past expert presentations: www.afsa.org/video. Two of our most popular expert presentations have been on Social Security and TSP. Another theme heard through the survey results is that retirees welcome opportunities to be connected with each other locally. If you haven’t already, check out the list of Retiree Associations on our website to see if there is one in your state. If not, consider starting one—AFSA can help reach out to members in your area and/or find a speaker for a kick-off event. If you are interested in exploring this idea, contact Retiree Outreach Coordinator Christine Miele at miele@afsa.org. Finally, you told us that you wanted to hear directly from AFSA more often on what's happening in Washington. On June 27, AFSA President Ambassador Barbara Stephenson will participate in a webinar for AFSA retirees; stay tuned for a separate invitation in the coming days. Another clear result of the survey was retirees’ desire for more transparent and easy-to-find information on the coordinators for Re-Employed Annuitant positions. AFSA went to work on this and we are pleased to provide the most recent Bureau Coordinator List—just updated in late May—for the REA/WAE Program, which the Human Resources Bureau (HR), HR Shared Services (HRSS) Employment Programs Section kindly shared with us. Secretary Pompeo recently lifted the hiring freeze at State, so now is a good time to inquire about REA/WAE opportunities. The list is available on our website at www.afsa.org/retiree in the “Re-Employed Annuitant Program” section. You may recall the HRSS implemented a new centralized registry of annuitants in 2013, which hiring managers can use as a tool when searching for qualified and experienced employees to fill a temporary need. HRSS nonetheless underscores that it is critical for annuitants to network directly with Bureau Coordinators when seeking positions. A wealth of information about the REA/WAE program, including a fact sheet and a May 2016 article entitled “Playing the REA Game – FS Work in Retirement” is available at www.afsa.org/retiree. Any questions about the centralized REA/WAE program can be directed to HRSEU@state.gov. AFSA has an opening for a retirement counselor to serve the needs of our retiree constituency. This is a part-time position (approximately 16 to 20 hours a week) primarily responsible for program development related to retirement benefits, oversight of an online social media community for members, and assisting individual retiree members with navigating existing Federal benefit retirement resources available. Please visit www.afsa.org/jobs to learn more and for information on how to apply. Congress passed the long-awaited TSP Modernization Act last November, giving TSP two years to implement the changes. Recently, TSP announced that the full implementation date will be September 2019. The changes will expand options for how and when we can access money in our TSP account. Key changes include: a) allowing multiple age-based in-service and post-separation partial withdrawals; b) allowing us to choose whether our withdrawals come from the Roth balance, traditional balance, or a mix of both; and c) allowing those of us receiving monthly payments to change the amount more frequently than just once a year. On May 4, the director of the Office of Personnel Management sent Congress a letter restating the proposals to cut federal retirement benefits contained in the President’s FY19 Budget Request. They include proposals to require employees to pay more into their pension trust funds, calculate pensions based on five years’ salary instead of three, eliminate the annuity supplement for retirees under age 62, and eliminate or reduce Cost of Living Adjustments to federal pensions. Congress has yet to take up those proposals, just as they did not take them up when first submitted by the Administration last year. It seems unlikely that Congress would prioritize action on benefits cuts in this election year. Passage seems especially unlikely in the Senate where 60 votes are required to advance most legislation. 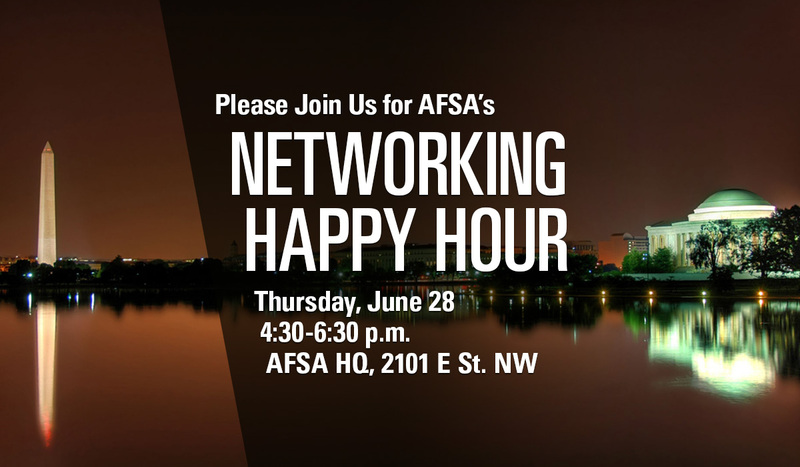 On June 28, we will host our summer networking happy hour from 4:30-6:30 p.m. The entry fee is $5, which includes one drink ticket. Subsequent drinks tickets (beer and wine) are $3. Click here to register. Then, on August 23 from 12:00-2:00 p.m., we welcome back Paula Jakub of the American Foreign Service Protective Association. She will provide an updated version of her popular presentation on the coordination of FEHB and Medicare. Click here to register for that event. The Foreign Service Online Community launched on Yahoo Groups on June 4, 2018. This is a platform where AFSA members can get in touch with each other, initiate discussions on current events, share professional insights, or even seek tips and advice from "the hive". AFSA chose this platform because many members of the Foreign Service are familiar with using Yahoo groups from other online communities, including Livelines, and the format allows members to follow specific topics and conversations. Our online community is what we make of it. Read an article that you think your colleagues would find interesting? You can share your perspective and ask others for their thoughts. Looking for advice on a new post, on retirement issues, on a travel destination? A user can post this kind of information on the site to quickly and easily leverage the expertise and experience of the wider Foreign Service community. The Foreign Service community is unique in its shared identity, experiences, and richness. We hope that our online community will reinforce and sustain our professional bonds. AFSA encourages all members to join the conversation. To join, email FSCommunity@afsa.org. Please provide your first and last name and the email address you would like to use and we’ll send you an invitation. You do not need a Yahoo email address to join, but you will need to create a Yahoo ID so that your email is recognized. To learn more, read our Frequently Asked Questions and other useful information. We hope you’ll take a moment to sign up and encourage your friends and colleagues to do the same. The more voices we have, the richer the conversation! If you retire abroad, you lose your diplomatic or administrative/technical status as soon as you retire, which means you no longer have customs privileges resulting from that status. If you have any further questions on the above or any transportation or travel issues, be in touch with our colleagues at the Transportation Office at TransportationQuery@state.gov. AFSA was pleased to welcome so many members to its headquarters over two-days of activities May 3 and 4 in commemoration of Foreign Service Day 2018. On Thursday, May 3, AFSA hosted a full day of programming along with an all-day open house where members met up with friends and former colleagues and had the opportunity to get a professional headshot taken, which was such a popular member benefit, we will look to offer it again soon. 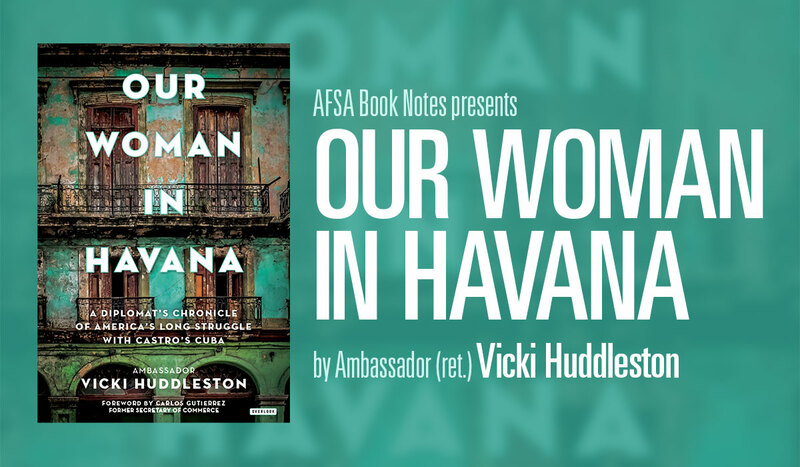 Retired Ambassador Vicki Huddleston headlined the programmatic activities with a Book Notes presentation on her book, Our Woman in Havana. The recording of the presentation is available on our website at www.afsa.org/video. The second program offered that day was by professional career and leadership coach Janeen Shaffer on "How to Craft the Perfect Bio". This is the first in a new series of professional development workshops AFSA is offering for members. A recording of this event is also available on our website. The final program of the day was geared towards members of the AFSA Speakers Bureau who were invited to participate in a workshop on "Advocating for the Foreign Service in Your Local Community". AFSA staff outlined key messages found to be effective in communicating the critical role played by the Foreign Service in preserving and maintaining U.S. global leadership. Participants shared their wealth of personal experience from time spent speaking to audiences in their local community and provided AFSA with feedback on the types of materials which would be helpful to continue their work. Look for pictures and more information on these events in the July-August issue of The Foreign Service Journal. 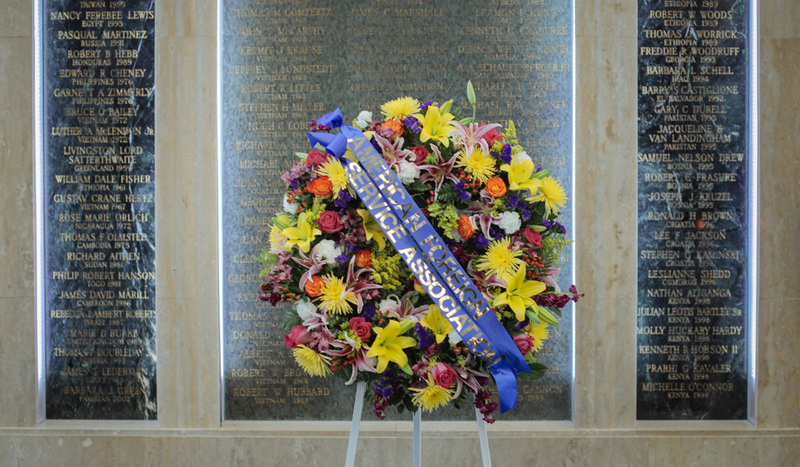 On Thursday May 4, AFSA held its annual memorial ceremony to pay tribute to colleagues who lost their lives while serving our country overseas. Additionally, members of the Foreign Service at almost 50 posts around the world joined in remembrance through observing a local moment of silence and/or having a local ceremony. Please see the coverage of these events in this month's edition of The Foreign Service Journal. Finally, a special thank you to those of you who sent letters to the editors of your local newspapers to recognize Foreign Service Day and talk about the vital importance of a professional Foreign Service to U.S. global leadership. To date, we know that 36 letters were published in newspapers around the country! This type of local outreach is a critical component to increasing awareness of who we are and what we do. Thank you! During a presentation at AFSA Headquarters on May 1, Jeannie Singleton of Long Term Care Partners (which runs the federal program) explained the impacts of long term care and how the Federal Long Term Care Insurance Program can help protect your financial plan in retirement. A video of the 70-minute session is posted online at www.afsa.org/video. The third annual Foreign Service Night at Nationals Park is getting closer! Join us on Friday September 7 at 7:05 p.m. as the Nationals take on the Chicago Cubs. Members of the Foreign Service receive specially discounted tickets and concession credits, the Foreign Service will be honored on scoreboard messages, and more! Come enjoy an evening with your friends and colleagues as the Nationals take on the Cubs! We will also celebrate the centennial of the Diplomatic Courier Service during the game. Click here to buy a ticket. Sales will be cut off at midnight on Thursday September 6.